Incredibly Priced Packages at the Four Seasons Bora Bora Resort are available on select departure dates for travel through May 31, 2011. Five nights starting at $3419 per person. Vacation includes: Round trip airfare on Air Tahiti Nui, 5 nights accommodation in Bora Bora, one FREE night, daily breakfast for two, fresh tropical fruits and mango coulis, half a bottle of champagne and congratulatory card upon arrival, traditional Marquesan Wedding gift (the Kumu Hei), round trip inter-island air on Air Tahiti and round trip airport transfers. The Four Seasons Bora Bora Resort is one of the newest resorts in French Polynesia. 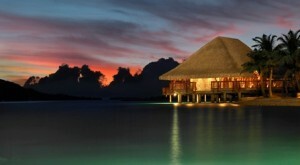 Call Remarkable Honeymoons to reserve your spot in one of the Four Seasons Bora Bora Resort’s lovely Villas. Our toll free number is 1.866.614.1803, feel free to fill out a Request Quote Form with your preferred dates, or send a direct email to Request@RemarkableHoneymoons.com.